TEMPE, Ariz.--(BUSINESS WIRE)--meltmedia today announced the opening of its new 20,000-square-foot office suite at the Rio2100 corporate park in Tempe, Arizona. The digital agency formerly occupied office space west of downtown Tempe. meltmedia selected its new location to accommodate the growth of both its local employee base and a national account portfolio. With its proximity to dining, hotels, and Phoenix Sky Harbor Airport, the new office suite enables meltmedia to easily service its clients in locations ranging from San Francisco to New York. The distinctive space was designed by Phoenix-based Krause Interior Architects to reflect the agency’s unique personality and work style. 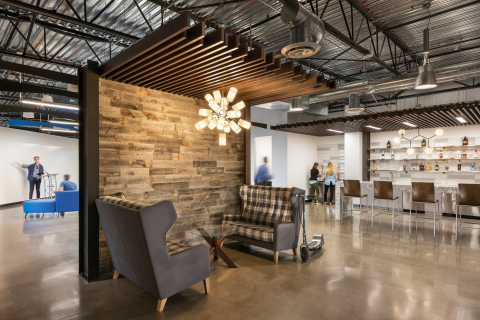 Iconic features include an employee café serving local beer and coffee; 120 square feet of moss walls; and an entryway specially constructed to foster a dog-friendly work environment, a longstanding part of the company’s culture. The office is also intended to serve as a gathering place for design, development, and technology meetup groups, with large classroom and presentation spaces. For media inquiries or to schedule a tour, contact clare.kirlin@meltmedia.com. meltmedia is an award-winning digital strategy, design, and development agency. Established in 2000 and headquartered in Tempe, Arizona, the meltmedia team consists of over 80 onshore, in-house designers, developers, and strategists who live to create the world's most inspiring digital experiences. Its portfolio of leading national biotech, pharmaceutical, healthcare, and other industry clients includes Genentech (a member of the Roche Group), HonorHealth, and Scholastic. meltmedia has been named the #1 web design agency, #1 mobile development firm, a top five software company, and a best place to work by the Phoenix Business Journal, and an Inc. 5000 fastest-growing company in America. Visit meltmedia online at meltmedia.com.